The city of which Lawndale is a suburb, as seen from Andrew Landon's office. Quinn - Attention, guys. We're just two little city gals from Lawndale. Cowboy - Lawndale's a suburb. Lawndale is the suburb in which the events of the Daria TV series take place. Maps of the region may be found in The Daria Diaries ("Welcome to Lawndale") and online at MTV's Virtual Lawndale webpage (see "External Links"). For a small and apparently dull suburb, Lawndale boasts its own corporate park, the upper-class prep school Fielding and a country club, and its own university. Lawndale dates back to colonial times: a newspaper article seen briefly in "See Jane Run" mentions roadworks on North Avenue found that "the street lies over a pre-revolutionary Dutch Orthodox cemetery" (presumably meaning Dutch followers of an orthodox church, not the name of the sect). The not-known-for sure city of which Lawndale is a suburb is only actually seen once in the series. Lawndale lacks tall buildings, but in Is It College Yet? when Mack goes to visit Jodie's father, there are tall buildings seen out of the very high window of Mr. Landon's office. This location must be close to Lawndale because Mack came by to visit him before school. I thought the Morgendorffers lived in a mid-Atlantic suburb, outside somewhere like Baltimore. They could have lived in Pennsylvania near the Main Line, though. while director Guy Moore thought it was New Jersey. "The Lab Brat" seems to imply Pennsylvania as the more likely location of Lawndale, as Kevin expresses his desire to aid Daria in their lab project after that night's Steelers game. Were Lawndale to be a suburb of Baltimore, it is unlikely Kevin would be a Steelers fan, as there is an historic rivalry between the Pittsburgh Steelers and Baltimore's football team, the Ravens. The state's voters get to vote on whether or not they have a property tax increase and for the three years Daria was there, they voted against it everytime and wrecked school funding. 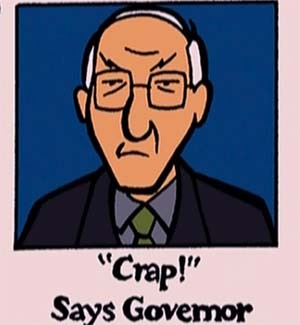 (The third time, the state governor was quoted saying "crap") ("Fizz Ed"). The governor looks like a Daria version of then-Governor of Maryland Parriss Glendening but Maryland doesn't get to vote on tax increases. In fact, none of the Mid-Atlantic states do! (California voters do and Eichler was likely writing about a recent vote there. Lawndale is within reasonable driving distance of the coast (the Sloane's have a summer home there), somewhere with southern accents ("I Don't"), and a rural desert with "cowboy" accents ("Speedtrapped"). In the same interview he mentioned Maryland, Eichler implies "I Don't" was set in Virginia. Daria went to Camp Grizzly when she was a child in Highland, and it was a few hours away when she was in Lawndale. Highland is canonically in Texas, a long way away from the mid-Atlantic. Yeah, there's no solving that one. Even the county in which Lawndale resides is conflicted in canon, with the MTV websites puttig it in Carter County and "One J at a Time" putting it in Lawndale County. For more on the Carter County/Lawndale County debate, see Off-Canon Canon. In the map, the town is surrounded by an ex-quarry and unstable ground across the south, with a railway line running through the south-west (possibly with a station). The east and south east are bordered by large woods, with roads running through them. (One of those woods is avoided at night) The school, the shopping districts, and most of the housing is clustered in the south and centre, with the large scale shopping out of the town proper and in the north west. After the dreaded Seven Points road network in the north, there are scattered houses (most of them in the north-west, clumped to the side of the mall), more greenery, and a few remote corporate buildings. Beyond that, all we can see are fields. The town's Lovers' Lane is right above an abandoned quarry, on the southern far edge of town and on the other side of the railway. It appears in the Lawndale map of "The Daria Diaries". Daria warns "engage parking brakes before making move". The Big Strawberry is a roadside tourist attraction shown on the Lawndale map in "The Daria Diaries". Lawndale High's web page implies that it may be torn down, and Timothy O'Neill is running the "Save the Strawberry" campaign to get it registered as a landmarked building. ("Someone at the National Register of Historic Places finally returned one of his phone calls.") It is sometimes called the Giant Strawberry in fanfiction. Believe it or not, this is based on a real roadside attraction at Strawberry Point, Iowa. Is a fictional gated community introduced in "The Invitation" and described in "The Daria Diaries" as "Where nobody mows their own lawn, mops their own floor or colors their own hair in the sink. The unofficial motto was "Private and Proud." Brittany Taylor and her family live at Deerview Court. It's in the south, worryingly near to the unstable landfill. Dega Street is located in Downtown Lawndale and most promiently shown in the episode, "Pierce Me". The Zon is assumed to live there. "Virtual Lawndale" puts this in the south west, close to the railway. Is a fictional corporate office park in Lawndale shown on the map in "The Daria Diaries." Morgendorffer Consulting is located in Building G. The sunlight reflecting off the buildings has been known to set nearby woods on fire. Located outside of town, up in the north. Is a public park shown on the map in "The Daria Diaries", near the high school. "Picnic tables, tennis courts, nightly Satan worship." Lawndale High School is one of the primary settings for the show. The school is featured on the map in "The Daria Diaries" and also the "Virtual Lawndale" map on the MTV website. The Lawndale Mall is also an important setting for the show and featured in multiple episodes. In the "Daria Diaries", the map was labelled "Cranberry Commons" but was changed to Lawndale Male for the "Virtual Lawndale" map. As seen in "I Loathe a Parade". Daria sums it up with: "Where the residents do the five percent of their shopping that they don't do in malls." Based on "Virtual Lawndale", it's next to Dega Street. It is the medical office complex shown in the episode, "Too Cute" where Dr. Shar's Swan Shoppe is located. It lurks on the north-west edge of town, hiding behind the mall. One of the earliest dating clues in the series is a banner that read, "1997 Adjustable Bed Show" visible when Daria and Quinn arrive. Is a fictional country club and golf course shown on the map in "The Daria Diaries", far away in the north-west from all the riff-raff. The description is, "Not restricted. At least, nobody's been able to prove it in court." Seven Corners is a complex intersection shown on the map in "The Daria Diaries" and described as "Lawndale's most confusing intersection". It's behind the high school and hosts a speed trap. Most notable for use in fan fiction. Is the town center for the main town, shown on the map in "The Daria Diaries". It has a statue of a bearded man "who was famous once, but nobody remembers why". The country club seen in "Is It Fall Yet?". It is seen along the Homecoming parade route during "I Loathe a Parade." The Coffee Snob is to the right of it, if one is facing the store. At store of uncertain business along the parade route of "I Loathe a Parade." Most notably, Daria Morgendorffer found Tad Gupty crying in front of the store because he had lost his parents. Axl's Piercing Parlor is a Dega Street business shown in "Pierce Me" run by Axl. Seen in "I Loathe a Parade" near the spot where Daria, Tad and Tom Sloane hop on the Fashion Club float. Also seen as "Mmm Sub". Cashman's is a high-end clothing store in the Lawndale Mall and a frequent shopping destination of the Fashion Club. Cedars of Lawndale is the fictional hospital in Lawndale shown in "Jake of Hearts" and mostly likely also the hospital in "Ill". Chez Pierre is a high-priced French restaurant in Lawndale that is a favorite of Quinn Morgendorffer and others of the Fashion Club. Is a downtown Lawndale store seen along the Homecoming parade route during "I Loathe a Parade." 24 Hour Photo] is to the left of it, if one is facing the store. Is a fictional hardware store seen in several episodes. It is located next to the Pizza Place. Lackluster Video is located on the other side of the store. The name is a play off of the Ace Hardware store chain. is the cosmetic surgery office run by Dr. Shar seen in the episode, "Too Cute." It is located in the Rx Plex. is a fictional store in downtown seen in the episode, "I Loathe a Parade". This is the store where Daria Morgendorffer buys the toilet paper and where she first meets Jane Lane during the parade. The local arcade, seen in "The New Kid" - with incredibly advanced virtual reality combat games for a small town in 1998 (and now!). Daria regularly goes and allots $15 of her weekly budget on it ("The Daria Database"). A cinema in downtown Lawndale, which has put on arty film festivals like Food In Film. Seen in "Monster", the Food In Film playlist shown in "The Daria Database". Likely holding the Fellini film festival in "Fire!". It also shows standard blockbuster films. Whichever county Lawndale is in, it has a number of other towns with high schools. Oakwood is mentioned in several episodes, as Oakwood High School's football team (the Taproots) are a key rival of the Lawndale Lions. MTV's old website mentioned the towns of Briarwood, Eagleton, Lawrenceville, and Lakeland. The newspaper's article on the Dutch Orthodox cemetary is warning that disturbing the grave may result in something supernatural. Debate exists among fans as to other possible locations for the fictional suburb, or at least places that had a curious similarity to it. For example, Richard Lobinske has brought up the Florida Connection (though this is more about inspirations than actual location). Suggested locations of Lawndale, other than the Baltimore area, include the following, listed with the fan who offered the idea. TheBrodsterBoy: Outside of Harrisburg, where Lawnton is IRL. Lawndale: Suburb of Philadelphia? from the Daria Fandom Blog II. Lawndale: A new angle on where it is? What's the population size of Lawndale? This page was last edited on 24 March 2019, at 00:41.